Running on a treadmill surface presents many different factors of consideration when ordering the proper footwear. Many of these concerns with crossover into the outdoor space, but a few are specific to running on a treadmill. Below is an in-depth look at features and specifics you should be aware of for buying your treadmill shoes. We also introduce 13 products and detail their parts to give an insight into what running shoes will work best for treadmill running. An additional submission to the treadmill space showcases the Asics brand. This brand has revolved their footwear submissions around solid construction and attention to detail. Their Jolt model is the perfect fit for the treadmill space due to the built-up construction. This model is made from a synthetic and textile blend at the outer shell. These materials combine to produce high levels of reinforcement, keeping the shell from bowing under pressure. Stitching is included to help space out the important elements of the shoe. A stitched toe box gives the user spacious room for natural toe splay and increases protection in this region. The logo doubles as a forefoot support, creating paneling that keeps the user centered within the shoe. The rubber sole is stacked and layered to produce additional levels of comfort and support. The design of the outsole takes on the natural shape of the foot, countering for natural pressures and shocks placed on the foot. The undercarriage of the outsole is treated to a tracked rubber field. This area features cuts and grooves to combat the rigors of rough surfaces, holding up to natural levels of wear and tear. This model is built to withstand the pressures and wear the treadmill produces, making it a fitting look for users. When it comes to applying the correct footwear for a treadmill, it is important to not get shorted on construction, strength, and stability at the undercarriage. This New Balance inclusion helps fit the mold of those requirements perfectly. This model is made from synthetic and textile means, keeping it lightweight and preventing the model from becoming too top heavy. Protective measures are included via paneling and capping at the toe box, the midfoot, and the heel. These areas help to resist abrasion, promote lockdown, and increase stability for the user. The flat lace-up system is also the desired design for the treadmill space, reducing the chance they get strung up between the track. The outsole of this model holds a great sense of intrigue. The treadmill often wears on the soles of shoes more quickly than that of an outdoor surface, so it is important to reinforce or stack contributions to the outsole. This one is designed via rubberized components, featuring a thin surrounding that acts as a midsole and a subset of the undercarriage. This protective surround prevents shocks and pressures and sets the course for the thicker portion of the outsole. This thick portion helps evenly distribute the weight of the user and spread these pressures to reduce discomfort. The undercarriage features thick grooves, elegant extensions and ample spacing to take on any surface type. This design format is beneficial to reducing the overall wear of the model. The Aleader brand is known for their commitment to unique design and that is exactly what we have with their Mesh Cross-Trainer inclusion. The shell of this model utilizes a mesh treatment, keeping the weight of this model extremely low. The shell shapes cuts, producing small holes for breathability. It forms a netting that permits the user full-function in their mobility and shifty movements. This design also promotes an ease of access for the user. The Fabricated upper helps stretch for an applied fit, returning to form to create the proper hold on the foot. The outsole of this model is created from a synthetic rubber, continuing the lightweight conversation. This sole is spaced via two components, a front and a rear, allowing for the proper hike at the arch. The arch is supported via paneling that rises at the forefoot, producing a stable region of comfort. The two outsole components help provide support underneath the heel and the toe box, combating the main areas of pressure and shock. The outsole features cuts along the rubber, separating the units to provide relief at the main areas of contact during your strides. New Balance adds contention to the treadmill space with their Fresh Foam Zante v3 running shoes. This shoe builds off of the foam element, with the undercarriage being constructed of a think, foam-like material. This material brings both flexibilities to the entire foot and allows for the shoe to reside in the lightweight space. The outsole rises about 2" into the outer shell, producing that solid base we require for treadmill running. The flexibility is increased via the use of these proprietary means, holding the proper amount of give in the toe box and keeping the heel stable during your run. The construction is carried out through the implementation of synthetic and mesh material mix. It is engineered meaning that it has gone through performance testing and challenges to ensure it will stand up to the test of time. Adidas is a brand known for their contributors to the athletic footwear spacing, marking their PLR model a top contender for the intended space. This model is designed from a synthetic build at the shell, producing a sound construction that does not fold under pressure. Paneling is included at the sides of the shoe, rising from the outsole to the upper. These panels keep the foot centered during movement, increasing the support at the forefoot region. A lightweight, stretchable upper is included to help the user reach an applied fit. This shaping returns to form, providing the stability and holding of a high-top model without all the bulky inclusions. A flat tongue greets the top of the foot, producing an additional holding mechanism. The outsole of this model features a flat and even-keeled design. This helps to cater to the natural build of the foot, increasing the support at the source of contacts and pressures. This rubber base produces a solid foundation for push-off, allowing for flex in lateral movements. The outsole is teamed with a small undercarriage platform. This platform mimics the design, producing support streams at the source of the contact. Small cuts and grooves are included to provide stability across a multitude of surfaces. Producing an even pattern also helps this model stand up to the test of time with wear and tear concerns. The trail running model is often a staple that translates well into the gym space, marking this Adidas inclusion as a fitting proponent for the treadmill. This model is made from a textile shell, giving the user the strength in construction and reinforcement that is desired. Leather, stitched paneling is included at the sides of this model, providing forefoot support. The insertion point is wide and stretchable, allowing the user to apply the fit they need. This material includes elasticity, returning to form to create a sound hold on the foot. A capped toe box is also included for increased protection against abrasions and pressures. The outsole of this model features a tractional design, catered to the rigors of a rough surface. The outsole is teamed with a midsole combination, providing an additional layer of support and shock absorption. The undercarriage of this model features small, block extensions that are spaced across this region. The spacing helps limit the build-up of debris and provides platforms for push-off and increases traction. These blocks also cater directly to the main regions of pressure the foot obtains, countering these pressures with relief and cushioning. The design is also built to withstand the test of time. The treadmill can often produce heavy levels of wear and tear on the feet, calling for a lightweight option hosted by the user. The Camel brand produces a mesh model that is perfect for work on the treadmill. The outer shell of this model is made from a breathable mesh, a treatment that carries to the interior of the model. This creates means of breathability that allow for a positive flow of air during movement, limiting perspiration build-up. The lace-up system utilizes thick, elastic laces. These laces help create a powerful lockdown system that can easily be adjusted for comfort. The outsole of this model is comprised of rubberized components. The sole undergoes full treatment to provide slip-resistance and abrasion resistance. The strong outsole is thick, running about 1.5 inches from the ground. This gives the user a stable base that they can rely upon for proper push-off and landing. A small platform of grippers extends from the under carriage of the outsole, keeping the natural form. Staying true to form helps this model combat shocks and pressures with ease. ​Starting the discussion is a brand that continuously produces unique structures and proper submissions to the running space. The Nike Tanjun running shoes mark for the perfect fit for treadmill running. Available in both men's and women's sizes and styles, this model takes on design patterns that can match any look. Heightened intrigue is drawn from the long and pronounced build-up in the outsole and midsole of the shoe. The outsole is made from foam and extends across the entire bottom of the shoe. It is built-up, padding almost 2" of thickness. This allows the user to receive shock absorbent treatment that greatly reduces the pressures admitted from landing and push-off. Due to the material construction, this shoe remains in the lightweight market. It is constructed of mesh and synthetic materials, reducing the weight of the shoe throughout. The interior features a memory foam lining that form fits to the foot. This provides proper stability measures and fully comforts the entire foot during usage. Extending into the high-end space is the ASICS Gel-Quantum running shoe. The Gel-Quantum technology is second to none and produces some of the most comfortable running shoes on the market today. The gel-like technology starts at the outsole. The outsole features four separate stacks of this material, creating strength and reinforcement throughout the entire undercarriage. It also makes this shoe resistant to pressures and shocks one would receive when bouncing up and down on a run. It extends to help pad your landing and reduce the amount of pressure needed during push-off. The outer shell is constructed of synthetic and textile materials, helping this model to reside in the medial weight category. The materials are also layered in a seamless fashion, reducing the amount of irritation one would receive on the inner portion of the shoe. The Gel-Quantum technology is extended into the interior of the shoe, with an absorbent insole greeting and comforting your foot throughout the duration of movements. Asics touches on the inclusion of gel-like technology with most of their inclusions but titling this model for walking purposes makes it a great fit for the treadmill. This model enhances upon a direct link between synthetic and fabricated means, allowing for lightweight stability on an external and internal basis. Asics utilizes heavy amounts of stitching to feature component parts and separates them into their natural regions. This allows for the proper spacing at the toe box and creates a natural heel cupping at the rear of the shoe. The lace-up system overlaps to produce a heavy amount of lockdown and support. The upper is lined with the fabricated material, keeping the interior lightweight and fully functioning when it comes to breathability. The stacked rubber outsole design does wonders for the bottom of the foot. Terming a midsole with the outsole allows for the reduction of shocks and pressures felt by the user. A rise is implemented at the arch to increase support at the undercarriage of the forefoot. This helps to add levels of comfort and cushioning to a region that is often ignored when it comes to centering the attention around the toe box and heel. This complete design features elements that allow for off-road usage, making it the perfect proponent for the treadmill space. When it comes to increasing the coverage in padding and support, no one does it better than Brooks. Their Launch 5 model comes from the latest releases in their product lines, containing all the bells and whistles the user would desire to fit the treadmill space. The fabric and mesh combination of the shell keeps the overall weight of this model low and reinforces the layering to protect the foot. The thick padding once again becomes a staple of the build at the insertion point, greeting the foot with streams of comfort and preventing slippage. The outsole of this model is thick and features many layers to provide an ample protector to shocks and pressures. This layering helps create a solid foundation for push-off, holding true to form and allowing the user to emit their natural stride patterns. A traction layer is also inserted at the undercarriage to provide stability and traction across a multitude of surfaces. This layer also promotes the durability of this model, allowing for heavy levels of wear and tear before requiring a replacement. ​Adidas adds to the treadmill space with their submission of the Alphabounce running shoe. It introduces a unique technology in the outsole called BOUNCE. This BOUNCE technology acts as a shock absorber and doubles as a think outsole that extends across the undercarriage of the shoe. The undercarriage meshes this innovative technology with a rubber sole base. This feature keeps your arch supported and reduces the pressure placed on this direct area. Fused with mesh and synthetic makeup, the materials remain light on the weight scale. The lightweight nature adds to your strides, reducing the focus needed on form and proper footing placements. This shoe also holds a spacious heel box, allowing for a simple fit for any size foot. The heel cup features a thick padding of materials that keep your foot stable and in the proper place throughout movements. Sketchers adds to the inclusion of proprietary means in their construction of the Go Run 400 running shoe. This shoe introduces 5Gen materials, which can be found directly above the foam-like padding on the outsole. This technology increases the pattern of cushioning the extends from the interior and exterior portions of the shoe and keeps the model weight on the lower spectrum. The build-up created by the outsole is thick and allows for an increased shock absorber in the heel and midsole of the shoe. It is comprised of both synthetic and mesh materials, keeping that weight low and performance standards high. The heel backing contains extra cushioning measures that fully encompass the entire ankle space. The insert uses their Goga Max technology, which doubles as a memory foam insert that form fits to your foot each time you put on the shoe. While this video does a good job of pointing out some of the areas of concern with the proper footwear, it leaves out some key details and explanations surrounding their reasoning. Below is proper look at features and product capabilities you should be looking for in the shoe selection process. The treadmill surface is often flat and remains consistent throughout the course of the run. The user can adjust the incline and decline of the machine and they also hold the power of speed control. Regardless of adjustments, this surface remains flat. Running on a treadmill usually causes for heavy use of the heel and relies heavily on the arch of the foot. Proper support is needed in these areas to absorb the shock associated with this running format and to reduce the pressures being placed on these key areas of the foot. The undercarriage and outsole represent the locations where particular attention is needed. The outsole should feature an increased use of rubberized materials or memory padding directly below the outer casing of the shoe. The primary area of landing occurs at the heel. Shoes that host the reinforcement of these rubberized materials and foams can cushion the blow to the ankle. When you run on adverse surfaces or outdoors, you will encounter uneven paths of running, heightening the need for personal preference measures. 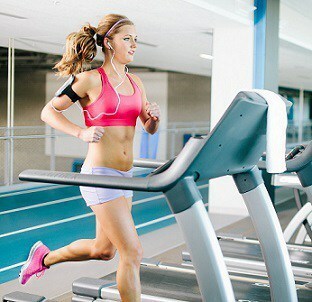 When running on a treadmill, you will be running on an even course throughout the duration. Keeping this factor in mind, we understand the primary need for a proper heel build-up. Lacking this build-up creates an experience where the foot is too close to the ground, often leading to the pounding of the feet and it takes a toll on these aforementioned areas. The arch area should offer a system of support and rise to evenly distribute pressures placed on the foot. The front of the foot and the back of the foot represent the two most utilized areas for push-off and landing, making the presence of an arch hike a key component to evening the weight distribution. Flexibility is a second important element of shoe used for treadmill running. One can test this measure by placing their hands on the front toe box and the back heel. Make a folding motion and attempt to collapse the shoe on itself. The front toe box should offer little resistance to your applied pressure. Shoes comprised of canvas, synthetic materials will fold rather easily. If it is treated leather or a strengthened material, it will often offer little give to your applied pressure. The less flexible the shoe, the more you will struggle on the treadmill. 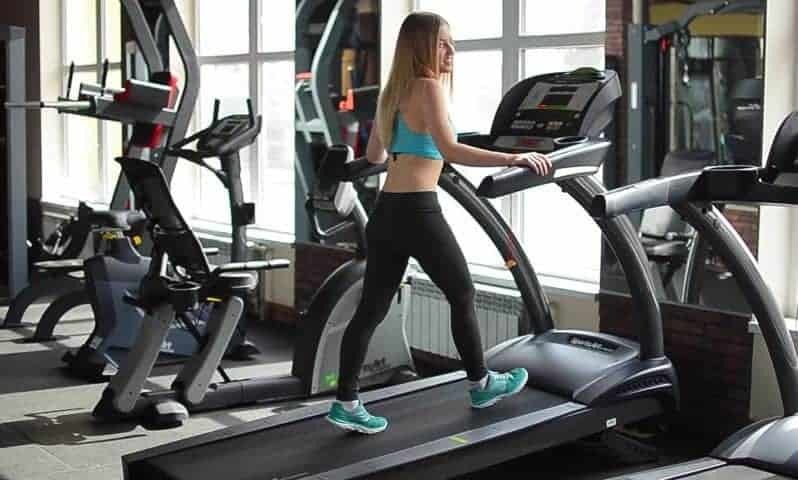 The treadmill offers an even, flat surface that doesn't introduce any obstacles or protruding elements, leaving the flexible shoe as the better option. As movement relates to flexibility, so does the benefits one would gain from these resistant shoe types. Due to the primary areas of high traffic in the heel and toe box, it is important to develop a proper stride. 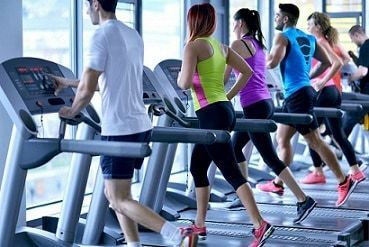 You know what you are getting with a treadmill, allowing you to draw your focus to the high-volume areas of the foot that are utilized in this running fashion. Flexibility allows you to gain the proper footing in your push-off and landing techniques. It also promotes easy access to these elements and does not restrict them as one unit. Therefore, you are able to switch up your pressure regimens, limiting the amount of pressure in a certain area across your pattern of runs. This helps keep a positive balance in your running patterns and reduces the injury chance to these high-volume areas. The weight of the shoe is also important. Running for extended periods have been shown to be a damper on your knees and joints. The primary cause of these problems is due to the use of improper footwear and protection. Heavier shoes promote the pounding of the feet. They can also reduce the lift in your strides and change your strides to compromise for this extra weight. Lightweight options allow you to focus on your strides, ensuring you are not overworking any one area of the foot. They will also allow you to focus on the push-off and landing, limiting the attention needed to object avoidance and the pressures of adverse surfaces. After going through our product briefings, we have selected the Nike Tanjun shoes as the top option for treadmill running. The nature of Nike shoes is to remain a low-profile option that keeps you close to the ground. This profile setting also helps to create flexibility measures and the proper support elements for treadmill running. The foam-like material utilized in the undercarriage keeps the shoe in the lightweight space. This foam technology also creates for the maximum amount of flex you would require in the toe box area. The material construction remains strong and the thickness of your push-off and landing platforms is one of the most supportive on the market today. Nike excels in the treadmill running space, creating options for men and women alike. Always remember to look for a flexible option that adds support in the midsole and outsole areas. Additional means of heel support and lightweight natures make for the proper features of a treadmill running shoe.